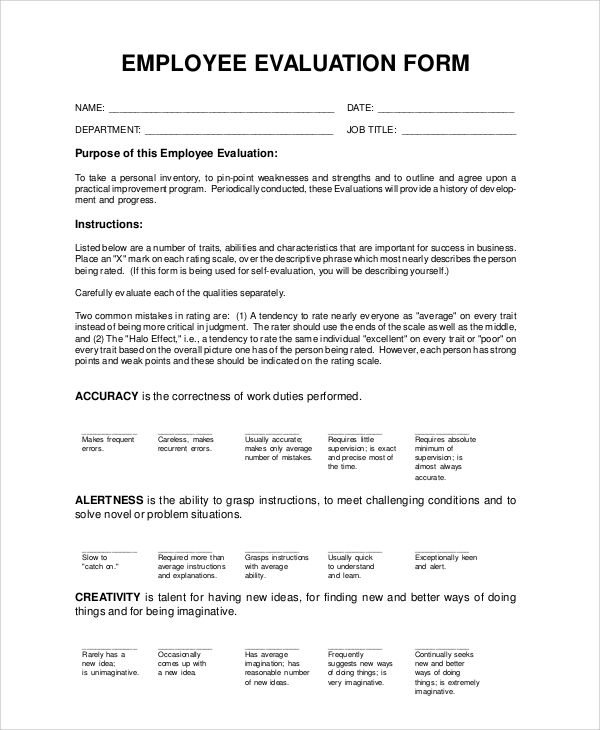 Employee Evaluation is a review of the performance of an employee which is done periodically. The employer carries out the activity to know the weaknesses of employees and also to know their strengths. It helps them to set employee development goals of the company or organization and get to know what areas need improvements. Here in this article, we have reviewed some sample used in evaluating the employees’ performance. The samples are all free for download. 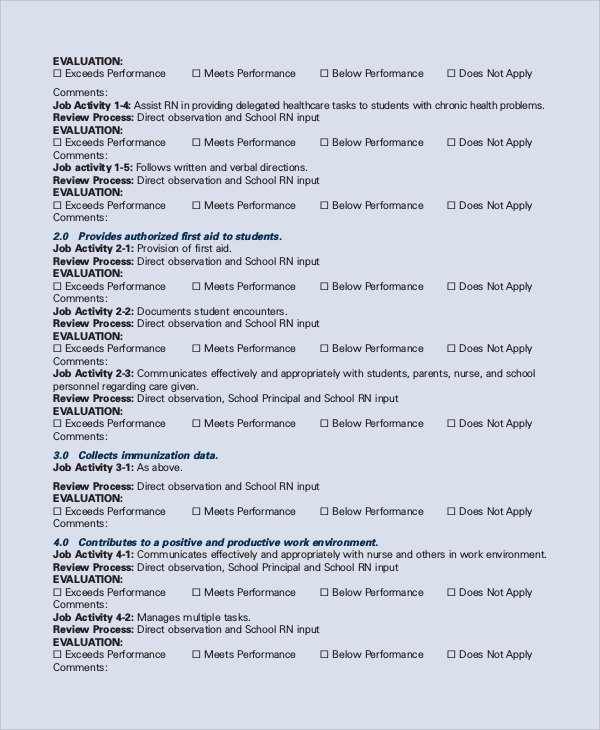 This is an example of employee evaluation which is done annually. The sample is prepared to guide employers who want to assess the performance of their employees annually. After holding an event, the host may want to know how useful the event was and sometimes they may want to know if it was effective. 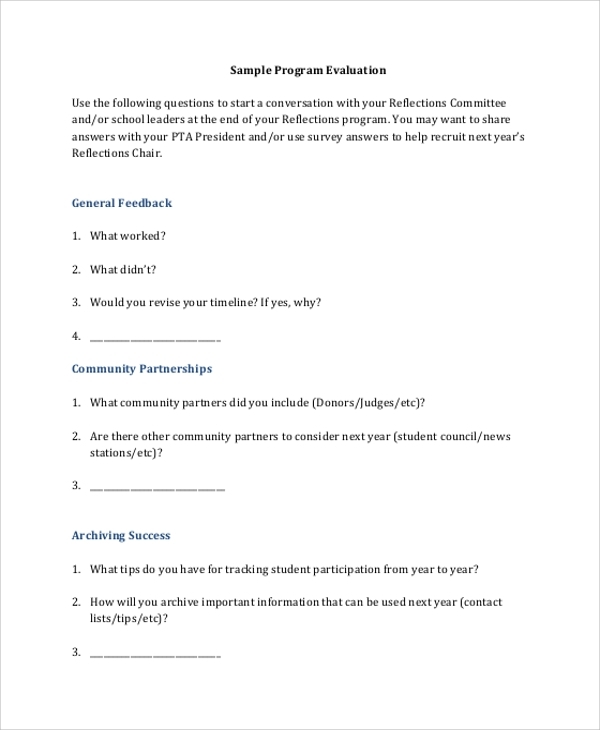 Using an evaluation sample can guide them in carrying out the evaluation. Sometimes the employer may want to know how the executive has been carrying out the activities of managing an organization and how effective the activities have been. This template is prepared for such purposes. This sample can guide employers in reviewing how talented or how the skilled an employee is. This sample is available on our site for free download. After the human resource conducts an interview, he/she may want to know how effective the interview was. The review is carried out to determine whether there are changes needed or not. This is an evaluation done for people who worked for a company as interns. This sample is used to give the employer or the manager a clear guide to ensure that the review process is carried out efficiently. 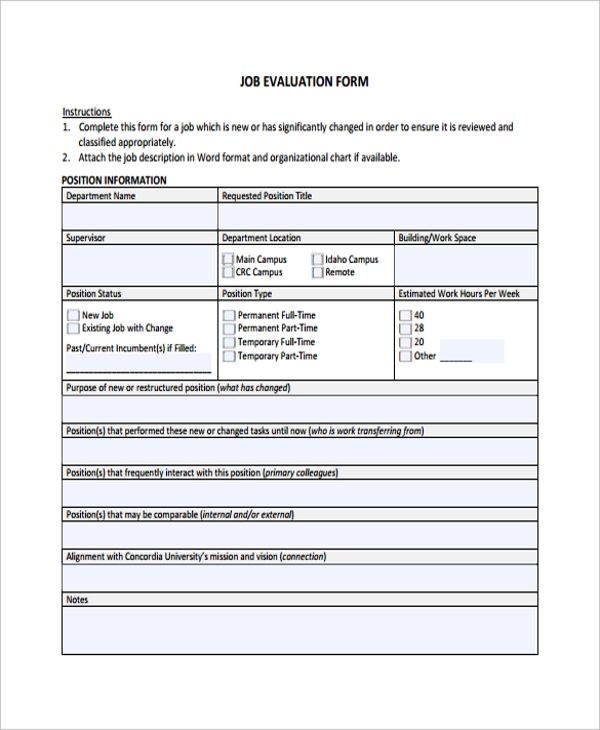 This is a sample that is used when carrying out a job evaluation. This template can be customized to suit the employer’s needs. It can be downloaded from our site for free. This sample is prepared for the teachers. It helps them to review a lesson after teaching. Various samples are available which can guide the teachers and ensure the review gives them reliable information. 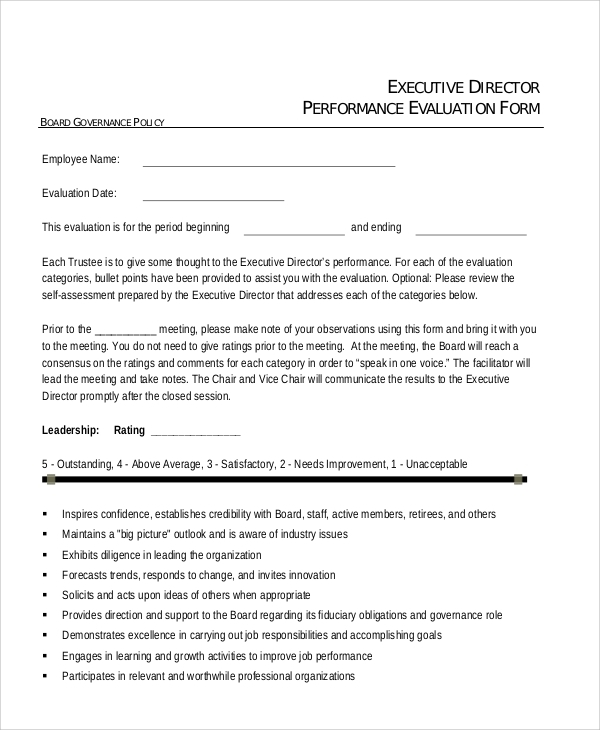 This is a sample used by the employer to review the performance of a manager. This sample is used to guide them on what areas to concentrate on during reviews and the type of questions that should be asked. Sometimes we attend meetings, and we want to know how useful was the session and determine whether the goal of holding the meeting was met or not. This sample can guide the one reviewing and ensures they obtain reliable information. 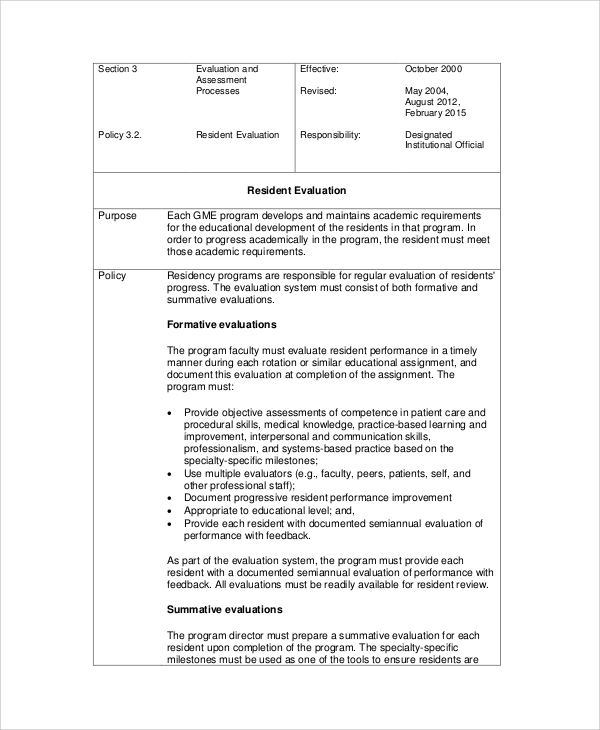 This is an evaluation carried out to assess the performance of a nurse over a particular period. 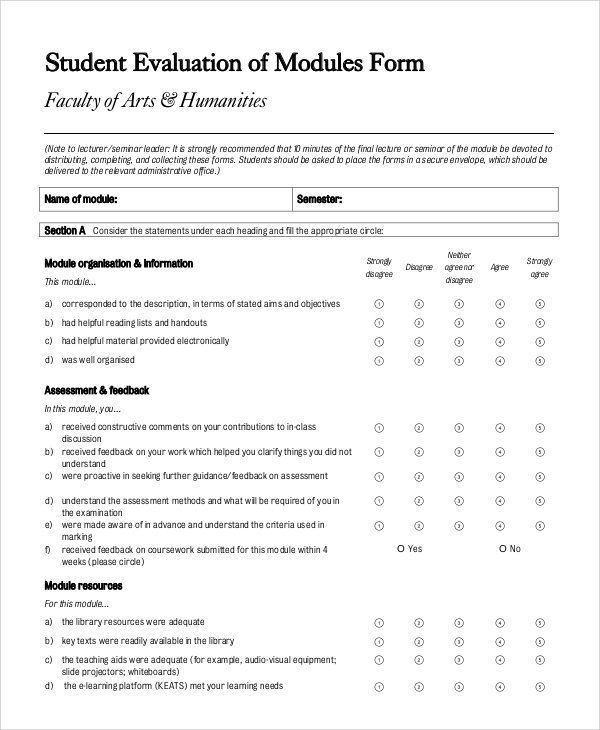 This template can act as a guide to help you in carrying out the review and obtain the reliable information. A sample performance evaluation is prepared for employers who want to assess the performance of their employees over a specific period. 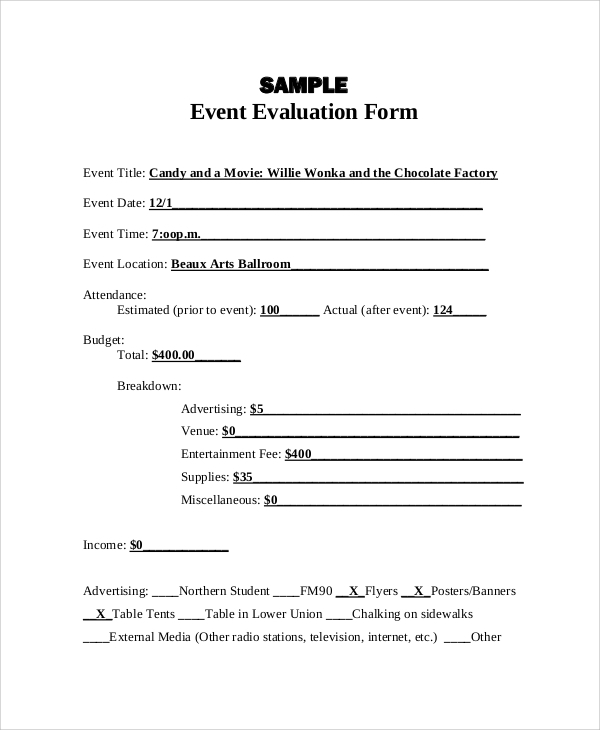 This sample helps them to know what question or area they should evaluate. At times you may want to know how effective or active a certain program is. Carrying out a review is needed at such a time. To perform the analysis, they can use Sample Program Evaluation to produce reliable information. Before moving to a new area of residence, it is good to understand the residence better before shifting. This will guide you in understanding the area better. This sample gives you the guidelines on how to assess the residence. 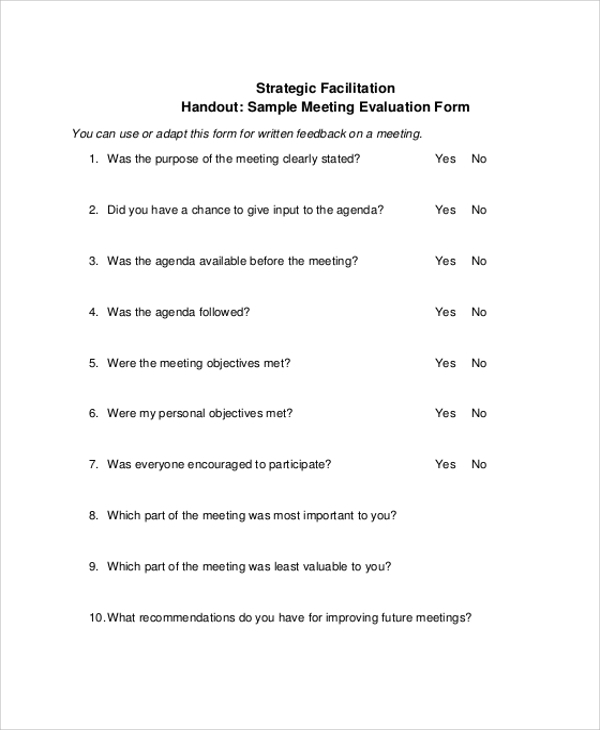 A sample conference evaluation is prepared for employers to guide them in carrying out the evaluation process in a meeting. This template is fully customizable and available for free download from our site. 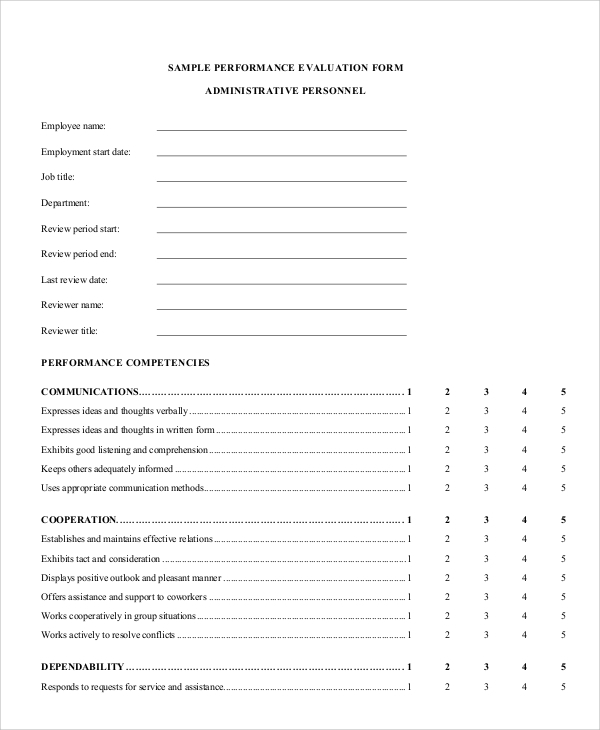 This is a sample of a staff evaluation prepared to guide the assessors or the employers to assess the performance of their company staff on their performance and how they conduct their activities. This is like a test. It is carried out to determine the performance academically or in other areas such as co-curricular activities. 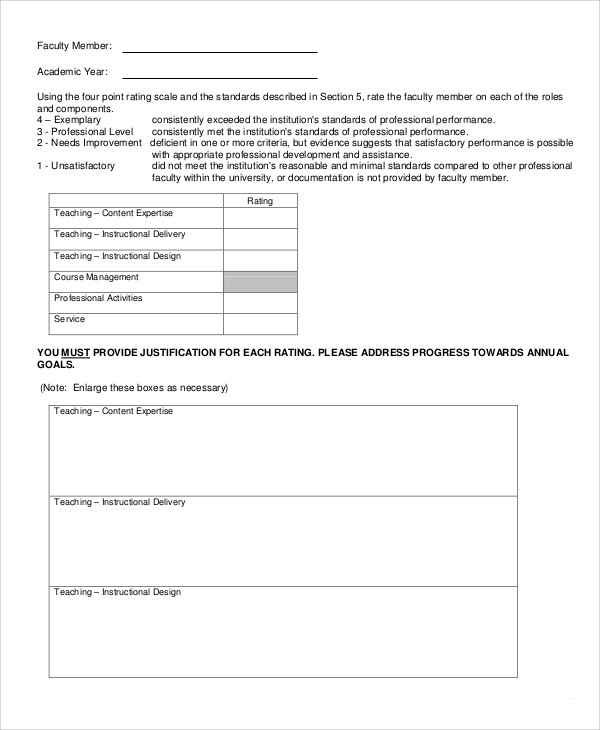 This sample is created for teachers who want to have a review of a student. 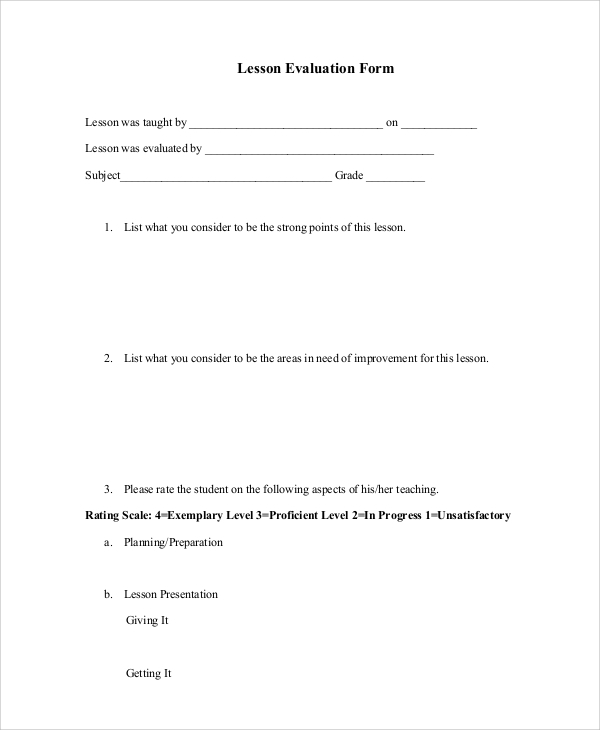 Training evaluation is carried out after a person, or a group has gone for training and the trainer wants to know how well they got the training.This sample can guide the instructors on how to conduct such assessments. A performance evaluation is carried out by the employers to determine how the employees have performed. It helps them to know the strengths and weaknesses of employees and get to know what areas each employee fit in better. With an evaluation report, the employer can set goals for professional development of the company. By identifying the weaknesses and the strengths of the employees, the company can determine whether they need more employees to handle a particular task or they need to fire some. 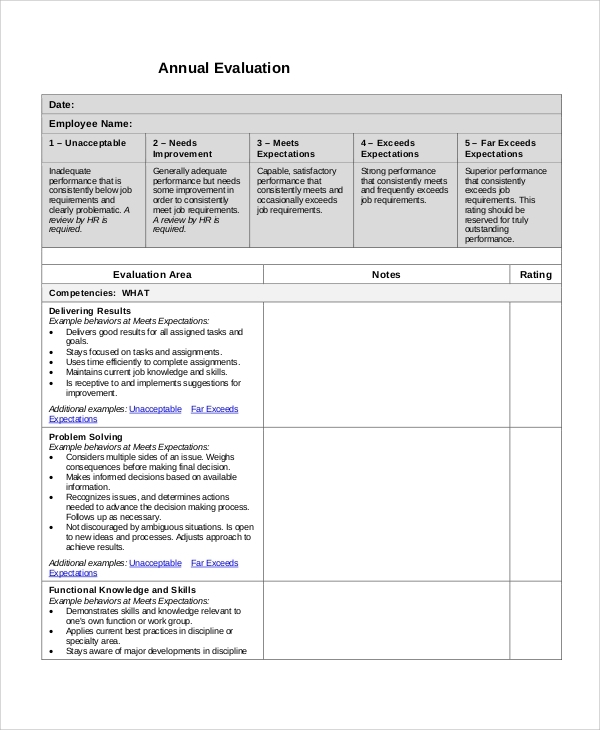 The evaluation report gives the employer an overview of the employee’s performance and their productivity. How to Conduct Employee Evaluation? For people who have never conducted an employee performance assessment in the past, it can be quite hard for them to do it, especially if they don’t know how it’s done. An employee evaluation can be done in various ways. 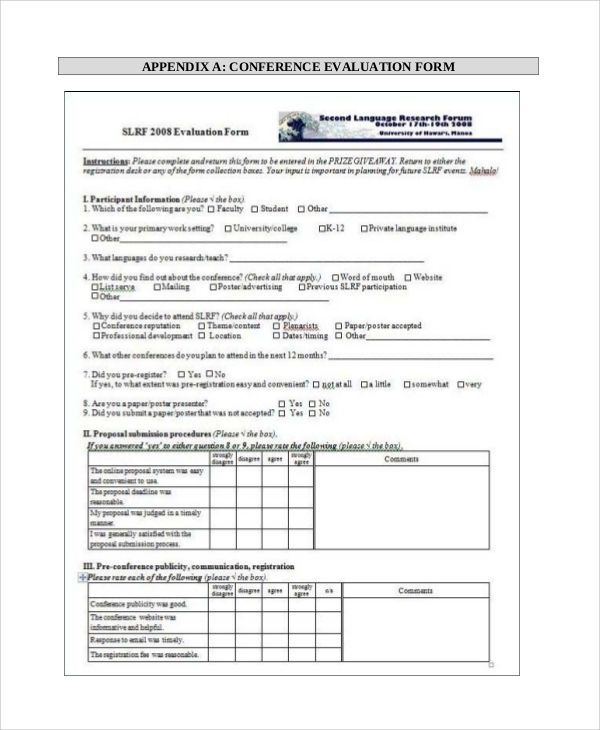 Some of the means to conduct the assessment are, use of an evaluation form for self-assessment, use questionnaires to ask employees some question related to their field of expertise or observe the employees as they work and take notes. Looking at the employee’s achievements is also recommended while carrying out the evaluation. 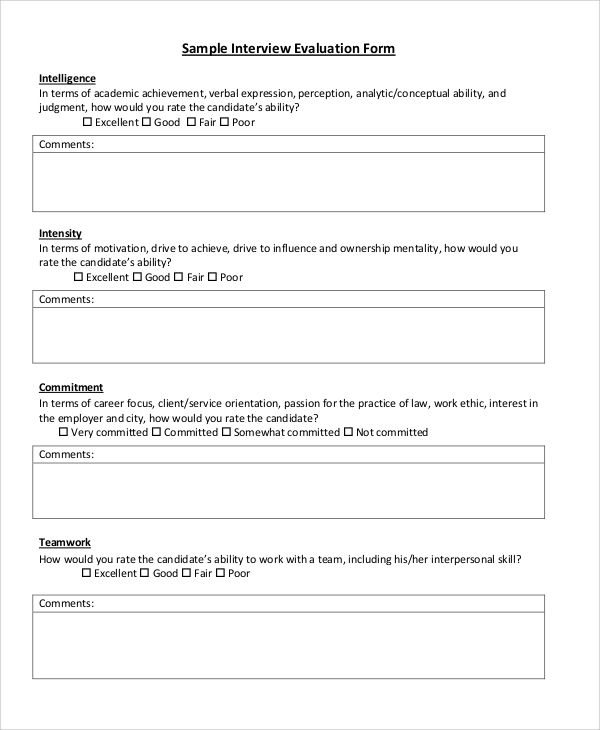 An employee evaluation sample is an important document. It guides employers on how to carry out the evaluation process and which questions they should ask employees for assessments. These samples can be downloaded from the web and can be customized as per the requirement.